Macro Musings Blog: Was Grexit Invevitable? Monnet was mistaken... If EMU does come into existence, as now seems increasingly likely, it will change the political character of Europe in ways that could lead to conflicts in Europe...What are the reasons for such conflicts? In the beginning there would be important disagreements among the EMU member countries about the goals and methods of monetary policy. These would be exacerbated whenever the business cycle raised unemployment in a particular country or group of countries. These economic disagreements could contribute to a more general distrust among the European nations. This does seem prescient now as the tension between core and periphery countries in general and the Troika and Greece in particular have shown the inherent tension in the currency union. So maybe this path was preordained. Maybe 'Grexit' was inevitable. Or maybe not. Maybe the Eurozone crisis happened when it did because of colossal policy errors rather than being a necessary outcome of a flawed currency union. I make this argument in a new working paper and contend the policy errors were the ECB's two tightening cycles in 2008 and 2010-2011. These tightening cycles were a huge mistake and arguably what set in motion the Eurozone crisis. They helped precipitate the sovereign debt crisis and gave teeth to the austerity imposed on the periphery. In early 2008 the Eurozone began contracting, as seen in the first panel of the figure below. The growth of total money spending, a broad indicator of monetary conditions, had started declining even earlier. With monetary conditions beginning to tighten and the economy slowing down most central banks would have cut interest rates. The ECB, however, did nothing and kept its target interest rate pegged at 4 percent. 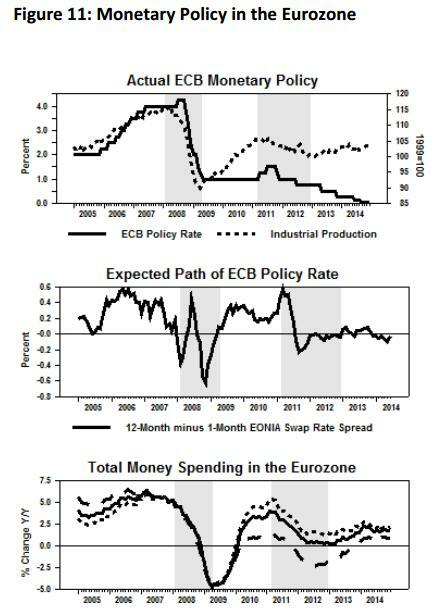 Moreover, as seen in the second panel below, the ECB was signalling a rate increase which further intensified the slowdown. Thus began the first tightening cycle of the ECB in early 2008. Finally, in July 2008 the ECB raised its target interest rate to 4.25 percent and kept it there for three months. This tightening cycle was arguably that shock the triggered the Eurozone crisis. The second monetary policy tightening cycle began in late 2010 when the ECB began signaling again that it would be raising its policy rate to stem the burgeoning inflation. This too can be seen in second panel of the figure above. This expectation began stemming total money spending growth in early 2011. The ECB followed through on these expectations by raising its policy rate from 1 percent to 1.25 percent in April and then to 1.50 percent in July where it stayed for four months. This second tightening cycle occurred even though Eurozone was still recovering from the first recession and is arguably the shock the intensified the crisis in 2011. As I show in the paper, these tightening cycles preceded the financial panic of late 2008 and sovereign debt problems and appear to have given teeth the austerity programs. How different would the Eurozone look today had the ECB had instead cut rates in 2008 and started its QE program back then? I think the Eurozone would be a lot different. And no, Grexit would not be an inevitable outcome. There would still be problems for the currency union, but they would problems that could be sorted out in an economy not beset by a depression. The ECB, in other words, bears a lot of the responsibility for the impending breakup of the Eurozone. Keep that in mind this week as the Grexit comes to fruition. Update: Some observers question whether ECB monetary policy was really too tight during the crisis. The answer is yes. For evidence, see my paper or this earlier post that shows a tight relationship between Taylor Rule gaps--a measure of the stance of monetary policy--and economic growth in the Eurozone. Some are also reminding me that it was Jean Claude Trichet's ECB that made the mess, not Mario Draghi's ECB. Fair enough. Other folks are pushing back against the monetary origin view altogether saying this crisis is really a balance of payment crisis or a creditor-debtor crisis. As a proximate cause, yes, but as an ultimate cause, no. Too see this, recall that the deflation experienced in the periphery has meant creditor countries like Germany are getting real wealth transfers from the periphery. The ECB could have prevented this outcome had it prevented deflation and the lower-than-expected inflation that followed. Also consider what would have happened had the ECB adopted a price level target. It would have required a temporary period of higher-than-normal 'catch-up' inflation that would have further moderated the imbalance between creditor-debtor countries in the Eurozone. Country-specific developments with the higher inflation growth would have further reinforced this rebalancing. Prices would first grow faster in the regions with the least excess capacity, the core countries. During this time, goods and services from the periphery countries would then become relatively cheaper. Consequently, even though the exchange rate among the regions would not change, there would be a relative change in their price levels making the periphery countries more competitive. The Trichet ECB could have done a lot more to prevent the creditor-debtor problems from reaching this tipping point. Instead they behaved like Sadomonetarists, as noted Paul Krugman. There is more on the creditor-debtor point in the paper. In fact the ECB is not a true central bank, not a lender of last resort by construction: Maastricht and subsequently treaties. Who should endorse the liability of this programmed disaster: the EMU architects or the managers of this so-called "Central bank"? Jlemile, yes, it was Trichet's ECB that did the damage, not Draghi's. Good point. I provide an update to note this observation. .
David, I think your next cartoon should be on the 50 shades of sadomonetarism... you could have a lot of fun with that. Professor Beckworth it seems to me you are missing the crucial point*: the Greek (peripheral) crisis is a pretty standard balance of payment crisis. The eurozone is totally different from the U.S., it is simply a currency union. There is no political will whatsoever to strengthen and deepen the integration (not to mention it would require a lot of time...), hence it was inevitable that eventually a shock would make the huge imbalances emerge and bring us where we are today. Did the ECB get monetary policy all wrong? Yes, absolutely, thanks to Trichet and due to political constraints. However, even if the ECB would have adopted a proper monetary policy it would have only delayed the present outcome. *I have only read the post, not the full paper. Patrick, a balance of payment crisis is a symptom of some other problem. Consequently, if I were to take your position--and I have in the past--I would call the core problem the eurozone not being an OCA. So I do recognize your point, but have lately come around to a different conclusion. I explain why in the update above. I completely agree with the update you wrote. Alas, I do not think you understand the european public debate about the crisis, which is worse than a high school drama. If you did you would know that the level price targeting is simply unfeasible. The northern countries (especially Germany) would never accept such actions. No southern countries has ever come close to the idea of asking something like that. It is a giant chaos with everyone blaming everyone else and basically no one at the political level is talking common sense on economics. 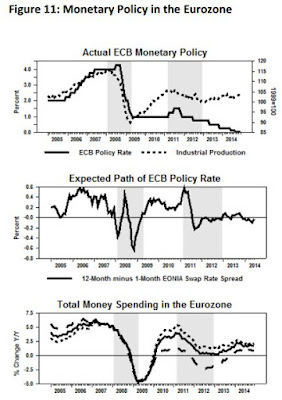 The ECB monetary policy disaster was strongly influenced by all of this. So while I agree on the economic level that a different monetary policy would have helped, I think that the political constraint of the eurozone are so huge that eventually this situation was bound to happen. Thanks for the NBER paper, I'll try to find some time to read it. Patrick, yes, high school dramas never end well :) I understand there were political constraints on what the ECB could do, but were the two monetary policy tigthening cycles and delayed interest rate cuts inevitable? If no, then some of this could have been avoided. Also, Draghi was able to implement a radical change to ECB monetary policy: a QE program. Given these things, I am left wondering that had there been different leadership at the ECB in 2008 this crisis would have unfolded very differently. "but were the two monetary policy tigthening cycles and delayed interest rate cuts inevitable?" "Also, Draghi was able to implement a radical change to ECB monetary policy: a QE program." Ok, but I would like to point out that Draghi was elected in the final months of 2011 and yet we had to wait until 2015 (!) for QE. Which once again says a lot about the constraints he faced. I don't know if it is possible, but shouldn't academics try to design a monetary system where a public sector default would not imply mandatorily a very tight money environment for the private sector ? It is certainly possible that the ECB could have prevented this crisis (to the detriment of Greece's creditors), but why should they? Others have commented on the moral hazard the ex post bailout would have on Italy, Spain, etc., but similar reasoning holds for monetary policy. Greek profligacy needs to be curtailed via structural reforms. Such reforms would not occur without this pressure (and even with this pressure! The rhetoric is striking.). Should we view this post (and your paper) as positive or normative? It appears to be an engineering question but drifts into normative when you discuss root causes. At the very least it ignores political economy. David B.---lots of good blogging in your last several posts. Like I always say, print more money. I have been sneered at for my run-the-presses views. But...really Greece is a good outcome? How much will Greece cost Europe? And now food and medical shortages?